I've been frequenting One Stop Comics in Oak Park, Illinois since 1988. My main comic book guy from 1974 to 2002 was Chicago legend Joe Sarno, but Joe didn't carry every title I was interested in. For example, I would buy Prime Cuts (the Fantagraphics black and white anthology magazine) at One Stop. Two years ago One Stop opened a satellite shop just one block away from my home in Chicago (while retaining the anchor store in Oak Park). I visit the One Stop in my neighborhood every couple of weeks and say hi to the guys. A few months ago I saw a copy of an Oak Park newspaper lying on a table. I've written previously about my fondness for newspapers and I couldn't resist paging through that issue just to see what that newspaper looked like. I wasn't expecting to find anything of interest to me in the paper so imagine my surprise when I spotted an article about One Stop Comics! "Spider-Man saves OP comic store!" 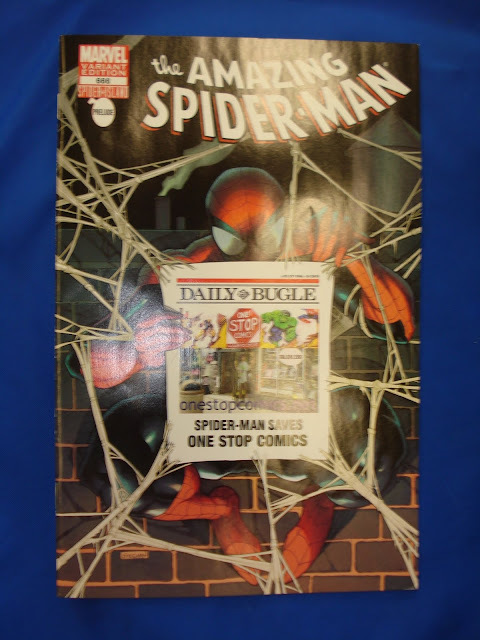 The article explains that a comic book store that ordered at least 575 copies of Spider-Man #666 could get 500 of them printed in a personalized edition with a photo of their comic shop on the cover! Of course this could project could tailspin into nothing more than an exercise in vanity since the only comic buyers who would see that comic were pre-existing customers who came into the store. But One Stop owner Rick Manzella worked the system well and managed to get this article into the newspaper and possibly thereby expand his customer base. Good for him! you can see the website of One Stop Comics over here. Many of you enjoyed the tour of the DC Comics offices presented by the Princess of the hayfamzone right here in The Hayfamzone Blog a couple of weeks ago, so you might find this update interesting. We recently found out that the Princess of the hayfamzone (let's call her Poth for short) appears on-screen in a major Hollywood film! The image above is a frame from the movie. Poth was interning a couple of years back at Holographic Studios in New York City and some movie-makers approached owner Jason Sapan about using his storefront for a scene in their movie. Mr. Sapan (who is better known to his coterie as Dr. Laser) said yes, as long as they would agree to include Poth in their movie! Movie-making ensued and memories faded. Dr. Laser was in a video store a few weeks ago and discovered that the movie had been finished and released and he called up Poth to reveal the news. The name of the 2009 release is Breaking Point and, if you have a Netflix account, you can watch it instantly by looking here. It features Tom Berenger and Busta Rhymes and Poth and it seems to have earned itself 3 stars out of 5! If you would like to learn more about Holographic Studios, just click here. The studios include a gallery of holograms and it is open to visitors on weekday afternoons. Dr. Laser has a long resume including having been a consultant on the Tom Cruise movie Vanilla Sky. What's next on the plate for Poth? Let's all keep in mind that this is a comic book blog and not a movie blog! We've proposed to Poth that maybe she could honor us with a photo tour of the Marvel Comics offices and rumor has it that she is pondering the proposal. Fingers crossed! Wally Wood is one of the best comic book inkers of all time; you would have a difficult time finding a comics fan who would dispute this statement. I am also very fond of his pencilling but there wasn't nearly as much of that and so he's not as well remembered for it. But his inking? Beautiful. I own a Jack Kirby Sandman page inked by Mr. Wood. 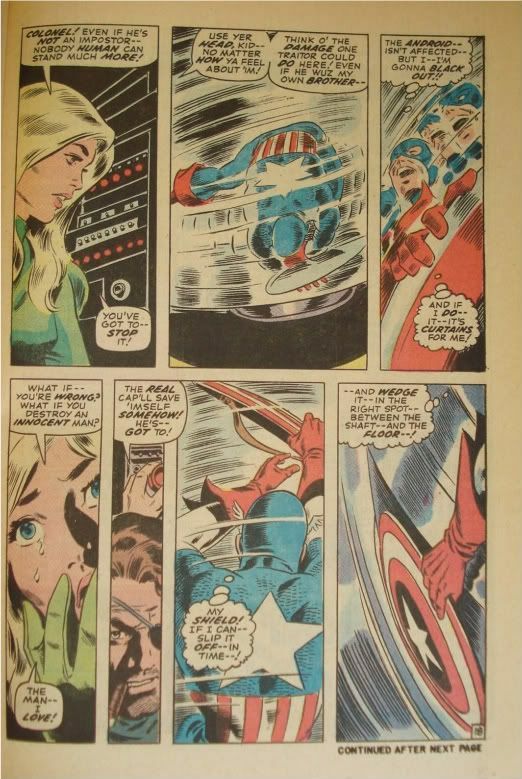 And pages he inked over Steve Ditko and Walt Simonson and Gil Kane and Garcia Lopez and Bob Brown (among so many others) were some of the most beautiful artwork produced by those artists. You remember that Gene Colan crossed the street to work for DC Comics after an editorial dispute with Marvel Comics back in the early 1980s. He was given Batman and Wonder Woman series to draw, and I started daydreaming. Wouldn't it be a fabulous teaming, I thought to myself, if Wally Wood were to ink Gene Colan? Either on Batman or Wonder Woman or anything. I just wanted to see a collaboration between the men. I waited and waited, but it never happened. We've lost both gentlemen now, and I've regretted for years that my curiosity could never be sated. But wait! There was a discussion on the Ditkomania yahoogroup last month regarding unusual penciller and inker pairings. I learned that John Severin inked a couple of Gil Kane covers back around 1970; I hadn't known of those previously and it was interesting to look up the covers online. I posted my wistful dream about Gene Colan and Wally Wood and, guess what? What I had been wishing for did happen! 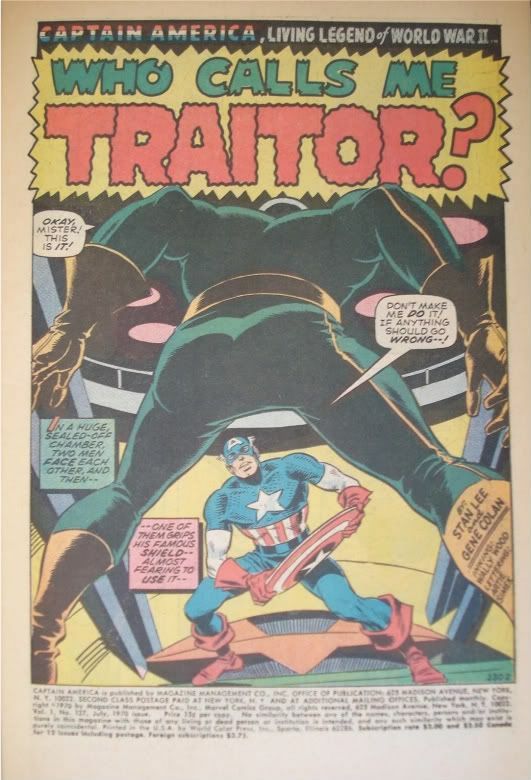 A follow-up post on the message board pointed out that the two gents got together for Captain America #127 back in 1970. It occurred a decade before I started wishing for it and I would never have known that my dream had come true if not for that internet bulletin board. I think the internet is so great! Lickety-split I ordered Cap #127 on ebay, and paging through the comic is an interesting (if eerie) experience. I display the splash page above, and here is the great page 18, and here (while it lasts) is the original artwork to page 18 that went for a pretty penny on ebay a couple of weeks ago. What's your comic book dream? Make sure you have one or else it won't be able to come true! Well now you can take a Superhero Tour of New York for $24.99 (or for free if you're under 12 years old). The two-hour walking tour is offered every weekend and visits the building where Batman creator Bob Kane worked as well as the building where Spirit creator Will Eisner had his studios. Also you go inside the Overlook bar where numerous comics artists have added their character to the jam drawing on the walls; the photo above is from Overlook and that Spider-Man at the far left seems to be by John Romita (or would you say it's by Gil Kane?). You can read articles about the Tour in the Chicago Sun-Times and USA Today, and here is the Tour's website so you can get even more details about the other attractions they visit. FOOTNOTE: Although I have still never visited either of those Big Two comics companies, wouldn't you know that The Princess of the Hayfamzone managed to wrangle herself a personal tour of DC Comics last fall! She wisely had her camera with her. Let me show you the Superman statue in their lobby and the way the floors are identified inside the building's elevator and an assistant editor's office. Oh, and how's this for a wall mural!